SparkPeople was founded by Chris “SparkGuy” Downie in 2001 as a way to “give back” after he was highly successful as an early eBay employee. He developed this program as a place where people could receive the weight loss support they need for free. There are now a few paid aspects of the program, but the majority of SparkPeople is still free. SparkPeople is a goal-based weight loss program. Rather than just sticking to nutrition, SparkPeople has a large component of fitness, motivation, and goal-setting. SparkPeople began in 2001 and has been growing ever since with over 11 million people participating in the various aspects of their multifaceted programs. 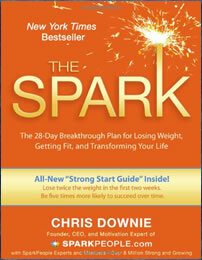 SparkPeople encourages new members of their program to read, The Spark, a book that is a 28 day quick start weight loss plan which includes a structured meal plan as well as an exercise regimen that encourages the fastest results possible. The macronutrient recommendations place SparkPeople as a moderate fat, high carb, low protein diet – similar the guidelines of the USDA Food Pyramid. A typical diet recommendation will come out at 15% protein, 55% carbohydrate, and 30% fats. Calorie recommendations are based on whether you select “moderate” or “aggressive” weight loss. Selecting aggressive will put the calorie recommendations on the low side – too low for an active person. Downloadable and interactive versions of some of the trackers found in the book. Interactive recipe wheels that let you create your own 300 and 400 calorie recipes. Additional sample meal plans at 1200, 1500 and 1800 calories. Dieters are encouraged to create their own meal plans because everyone has unique needs and preferences. Advice is provided on how to create a healthy diet and dieters have the option of accessing structured meal plans if they prefer. The great strength of SparkPeople has to do with all the resources offered to members. This section of SparkPeople offers a collection of over 300,000 healthy recipes submitted by members and the ability to share your favorite recipes with others. SparkRecipes also gives members cooking tips and techniques that can assist dieters in making everyday recipes healthier. Besides a mobile version of the main website, there are three smart phone applications are also available to members of SparkPeople for use in the grocery store, the gym, and while eating out. Their apps work on iPhones, iPads, Android, and BlackBerry devices. This app allows people to track their calories consumed as well as there calories burned through exercise. It displays the nutrition aspects of the foods eaten as well as the amount of calories different exercises will most likely burn. This app allows dieters to have access to there recipe collection anywhere. The user can type in ingredients they have and the app will give healthy recipe suggestions. This is a paid app, but helps dieters pick the healthiest and freshest produce based on what it should look and feel like when ripe as well as recipe ideas to use the produce in. This is helpful for those who want to try new fruits or vegetables but aren’t sure how to use them in recipes. It’s available for $1.99. SparkPeople live is a new paid feature of SparkPeople. This feature offers 24/7 live support for those following the Spark diet. It allows subscribers to interact with other members in a live environment and participate in live classes and seminars. They allow members to try this service free for a week and then it’s 12.99usd a month which is a bargain considering all that is offered through SparkPeople live and SparkPeople in general. This is a daily blog published by SparkPeople. It contains 1000’s of useful articles about nutriton, motivation, and fitness written by experts in the field. The blog is updated daily and even highlights member success stories. In addition to their standard weight loss support and help, they also have additional programs designed to help their members. SparkAmerica– Conducts contests and challenges to get Americans moving. SparkSavings– Helps members also get their finances in order. BabyFit– Helps expecting and new mothers have healthy pregnancies and healthy babies. SparkTeens– A weight loss program designed for adolescents that addresses their unique developmental needs. The majority of SparkPeople is free, however SparkPeople LIVE! is a paid subscription service offering live interaction with others in the community trying to lose weight. This is borne out of the research that shows people are more likely to lose weight when supported in a community of others doing the same. Even considering the few paid aspects of SparkPeople, it is still an incredible value because of the wealth of free information also provided. SparkPeople is a great website, with an amazing array of easy-to-use tools. Many people have had success with SparkPeople as it takes more of a holistic approach than just prescribing a diet plan. However – the caloric and macronutrient recommendations may not suit everyone, and if you intend to build or tone muscle, the combination of low-calories and low protein may not be appropriate. A higher-carb diet is more appropriate for endurance athletes who are burning a lot of energy. Also, people who require a lot of one on one support and counseling will probably only benefit from The Spark Diet if they subscribe to SparkPeople Live. Over recent months SparkPeople have incorporated a large set of social networking features – such as personal blogs, profiles, and other communication tools. Highly recommended. The SparkPeople Website can be found here. This site is awesome. I joined in April and as of today have lost 29 lbs. I am finally back within a normal weight range. I love this site and will promote it to anyone who will listen. Not only does it let you track the calories you eat, and burn, the site will let you track specific nutrients, like iron, sodium, vitamins, Calcium, etc. You can get detailed daily reports or reports that show you your progress over long stretches of time. Also, there are lots of free workout videos! they have lots of cardio workout videos, and also a bunch that target different muscle groups. So awesome. There’s also tons of information about anything food or fitness related. Really great free resource. For Helen in Choctow, I live in Spencer Oklahoma. Able to stay at home after years of working, so started to follow the Spark site and ideas. Reading the book now. I already see that being at home and more isolated, makes involvement with others doing this more appealing. If you’ve found some folks or activities, I’d like to know. I am checking on OKC now, to see if any activity there. Just bought the book and read the intro. Just curious about the web site. I need to lose 60 pounds. I live in Choctaw Oklahoma and plan to meet goal weight by end of year. Are there any Spark people in Choctaw Oklahoma? I started this site about 3 months ago. I’ve lost 12 pounds and counting! I’ve been trying to lose weight for 3 years, and this website is helping me FINALLY do it! It is alot like a myspace but full of other people who are trying to lose weight and get in shape!! And theres tons of people who have already achieved they’re weight loss goals and when you look at they’re pictures it motivates you!! I love sparkpeople. It has a reward system that encourages you to learn more about healthy eating and proper exercise. The nutrition tracker has been a great help in making me think about what I am eating. It has also put all my favourite foods back on the menu, but in moderation. I eat peanut butter every day and I am so much happier because of it. The best part, after I joined some groups, I was immediately contacted via email with a warm welcome. I felt completely apart of the community and supported. This was something I have not gotten from other online sites. Last but not least, it is FREE! I joined SparkPeople and using the nutrition tracker tool helps me think about what I eat on a regular basis by allowing me to track my food and calorie intake daily. The nutrition tool also tracks fat, fibre, protein and carbs and helps me to monitor and maintain a balance of each of these components in my diet. No prescribed food, no special purchases, no pills; just knowing and understanding what I eat! I also use the site to track my exercise and calories burned and this helps keep me motivated to get moving (even to clean my house!). I have only scratched the surface of what the site has to offer and would highly recommend to anyone struggling with weight loss and trying to develop better eating skills and a healthy lifestyle that they check SparkPeople out. This is one of the best diet site/tool out there. It’s absolutely free and is fantastic for picking and choosing you diet. It gives you a plethora of foods, condiments…you name it, to choose from and then you plan your week’s menu. What I looove is that you can go in at any time and change, make notes, whatever you want if you need to. It is also a great site for buiding a support unit amoung other Spark users. I personally think it’s the best thing out there, and like I said….IT’S FREE!!! join its a great site I am on it!! I think this is an awesome website. It is free, you join and either log your progress alone or you join groups, add friends, etc. I would check it out!